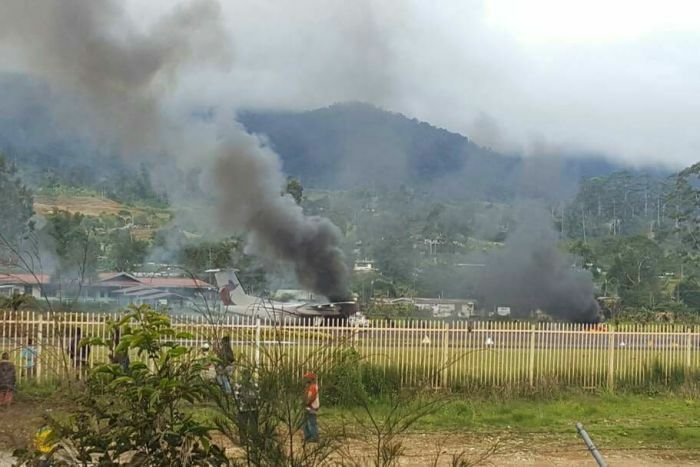 An A Link PNG Dash 8 aircraft, operating on a round trip between Port Moresby-Jacksons International Airport (POM/AYPY) and Mendi Airport (MDU/AYMN), Papua New Guinea, was destroyed by fire at Mendi Airport. The aircraft was parked on the ramp when it was deliberately set on fire by supporters of an election candidate after losing a court case. A Notam (Notice To Airmen) was subsequently issued, stating the airport was closed "due civil unrest". The airport had been closed from the 1st October 2017 until the 11th February 2018 "due to public intrusions onto the runway, damage to airport facilities and threats to NAC staff." Angry supporters of a losing election candidate have set fire to a passenger plane in Papua New Guinea's Highlands. Witnesses said the Dash 8 aircraft was stopped from leaving the town of Mendi this afternoon and was set alight. The nursing director of the Mendi Hospital, Anna Anda, said supporters of the losing candidate for the Southern Highlands provincial seat rioted when word of a court decision about the election reached them. "They just went amok and just burned everything, even the Air Niugini [plane]," she said. "I can see black smoke coming up, it's so scary." Air Niugini issued a statement confirming the plane had been damaged. 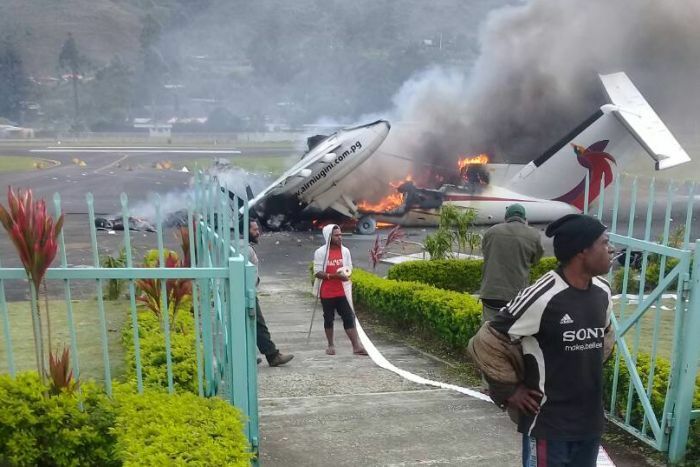 "A Link PNG (their subsidiary airline) DHC-8 aircraft was involved in civil unrest at Mendi airport, Southern Highlands Province today following an election petition decision," the company said. "The aircraft has suffered damage when rioters invaded the tarmac, and National Airports Corporation has also closed the airport." Air Niugini said passengers and crew got off the aircraft and none were harmed. The dispute over the provincial seat has already led to deaths in the Southern Highlands and attacks on businesses formerly owned by Prime Minister Peter O'Neill. Witnesses in Mendi said the mob was trying to burn down more buildings in the new violence. Mr O'Neill said the Government would hold an emergency meeting of its National Security Council and respond to the violence. "The actions we have seen today in Mendi are an absolute disgrace," he said. "A state of emergency will be declared, and additional security forces are being deployed to prevent further unlawful behaviour. "Those involved will be detained by police and prosecuted."